NGC 602 is a young, bright open star cluster surrounded by N90, a star-forming cloud of natal gas and dust of about 90 light-years across, located some 196,000 light-years away near the outskirts of the Small Magellanic Cloud, a satellite of our Milky Way galaxy, in the constellation of Tucana. Radiation and shock waves from the stars have pushed away much of the lighter surrounding gas and dust that compose N90, and this in turn has triggered new star formation in the “elephant trunks” (the massive pillars of gas and dust at the ridges) of the nebula. These younger stars are still enshrouded in dust but are visible at infrared wavelengths. 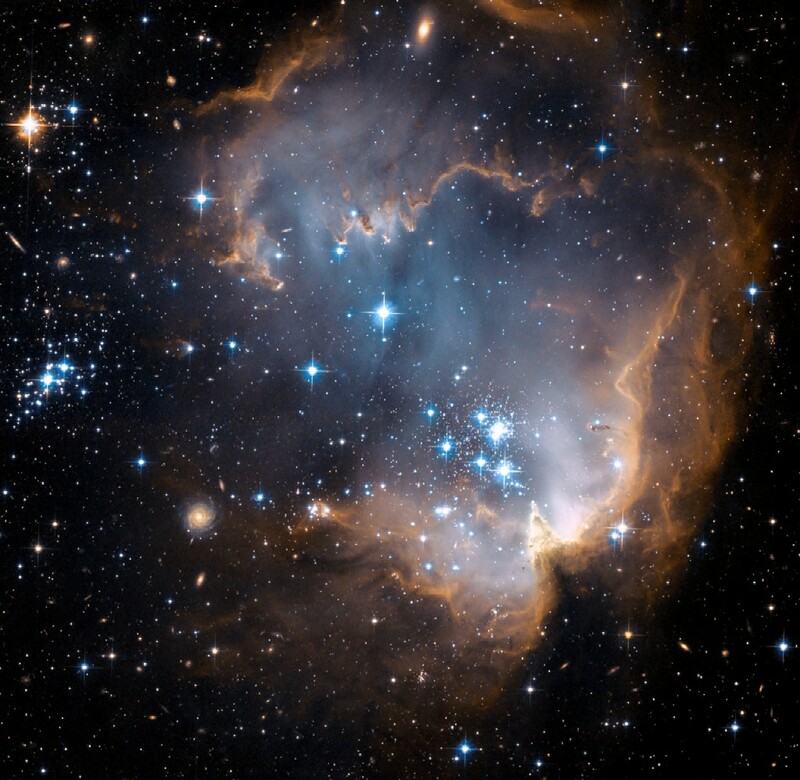 There is also a population of small newborn stars, observable around the bright blue stars at the center. The existence of dark clouds of dense dust and the cluster being rich in ionized gas suggest the presence of ongoing star formation processes. Furthermore, they have not yet contracted to the point where their cores are hot enough to begin converting hydrogen into helium. In this region it is possible to trace how the star formation started at the center of the cluster and propagated outwards, with the youngest stars still forming today along the dust ridges. Star formation started in this region about just 5 million years ago with the formation of the central cluster and gradually propagated towards the outskirts. This image is a composite of many separate exposures made by the Advanced Camera for Surveys on the Hubble Space Telescope using several different filters. Also visible in this sharp Hubble view are many background galaxies, which are hundreds of millions of light-years or more beyond NGC 602.